It’ll be available on June 18. Jurassic World dinosaurs are stomping into Rocket League in June. The new downloadable content is coming to the soccer-with-cars game in celebration of the Jurassic World: Fallen Kingdom release on June 21. The Rocket League content unlocks on June 18 for $2 on all platforms. The $2 pack includes a Jeep Wrangler, one with a Jurassic Park decal, the other Jurassic World. It has new wheel and engine audio, designed so it looks just like it does in the movies. 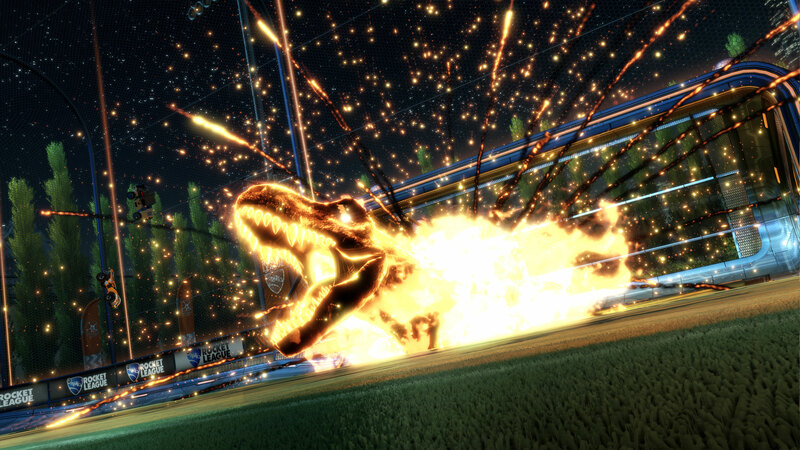 Dinosaurs won’t be chasing you around the area, but Psyonix has added a T. Rex goal explosion, too. Likewise, a new topper (an orange hard hat), three player flags (Mr. DNA, Jurassic World, and Jurassic Park), and three antennas (InGen, Jurassic World, and Jurassic Park) have been added with the Jurassic World pack. Rocket League has previously paired up with Universal for Fast and the Furious DLC in October. Elsewhere in Rocket League, a new update called Salty Shores arrived on May 29, introducing a beach-themed Arena and new in-game content.